The development of autonomous systems is one of the technology trends driving the fourth industrial revolution. Autonomous systems in transportation are perhaps the most widely talked about, but beyond this we’re already seeing systems deployed in sectors like environmental monitoring and agriculture. The range of potential applications is huge: search and rescue, border surveillance, construction, energy, health, sports and recreation, agriculture, and food and water security to name a few. And whilst advances in this area are vast – fueled by machine learning, data science, robotics etc. – no man-made system can perform at the level of living organisms. How do animals achieve such incredibly complex tasks and what are the biological principles that govern them? How can we use nature’s solutions for our own objectives? We’ve been assembling an international network of researchers to understand these fundamental questions; if you’re interested then please get in touch. Flying animals can perform precise, agile manoeuvres, like hovering while feeding from a moving flower, mating in mid-air, and tracking and intercepting prey. Dr Tom Daniel (University of Washington and Director of the Air Force Center of Excellence on Nature-Inspired Flight Technologies and Ideas) is investigating how moths achieve these tasks which have very low probabilities of success. Dr Daniel is building fundamental understanding on how they integrate multiple sensory modalities (e.g. vision, inertia), which may help to improve flight control in engineered aircrafts. The mechanics of the moth model may also provide insight into alternative modes of sensing and actuating. Robber flies are relatively small insects, but have evolved flight strategies which make them as successful predators as larger flying insects. Dr Gonzalez-Bellido (University of Cambridge) is investigating specific anatomical adaptations in their visual system that enable them to track small targets, and adjust their flight trajectory to intercept their prey with high-accuracy. Birds have evolved their own adaptations for flight, dynamically adjusting their wing shape in response to wind. The Windsor group at Bristol University record and model the dynamic 3-D structure of bird wings during flight. 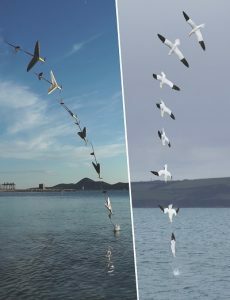 They’ve shown that this knowledge can be applied to make drone wings which respond to the environment and improve flight. At Imperial College, Dr Mirko Kovac’s Arial Robotics Lab has combined the capabilities of two different organism types to develop an aquatic micro-air vehicle for monitoring water health. The robot, as seen below, dives into water like a gannet, and then launches like a flying fish back into the air. You can see a video of this in action here. Whilst flying animals are an obvious area for inspiration, worms can also give us new solutions. C. elegans for example are tiny nematode worms that burrow through soil – a complex chemical environment – in search of food. A robot inspired by this worm and capable of navigating obstacles with minimal sensing has been developed by Dr. Boyle’s group at the University of Leeds. Social animals bring a whole set of useful and challenging behaviours. Dr. Paoletti’s group at Liverpool is looking at swarming and schooling to develop groups of robots that can collaborate locally to perform tasks such as recognition and surveillance. Engineers taking inspiration from nature, often called biomimicry, is nothing new; Leonardo Di Vinci’s flying machine is a famous early example. With today’s technology however we can go beyond merely mimicking nature; we are capable of looking deeper at the underlying natural principles, and adapting them to improve our own systems. 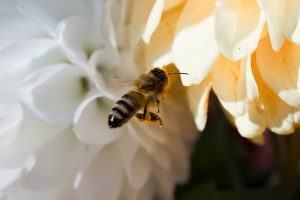 The challenge now is to bring together expertise from engineering and biology to study, understand and assess the potential benefits of looking at nature for inspiration to enable improvements in application technologies. This is something we’re actively engaged in at the Institute of Security Science and Technology. If this is something you are interested in please get in touch! Silvia is an engineer with a PhD in computational neuroscience from Imperial College London. In her Ph.D. she looked at how different areas in the primary visual system interact to process incoming information using large data sets. Silvia is currently working as a Post-doctoral Research Associate in the Department of Bioengineering and the ISST working on pathways from nature inspired research into application technologies.